Who doesn’t love Holi — a riotous festival of colours that is celebrated across India as revellers usher in the spring season? While this year Holi falls on March 20, the UAE takes the celebrations into the weekend with a series of concerts, headline acts and meal deals. Gulf News tabloid! 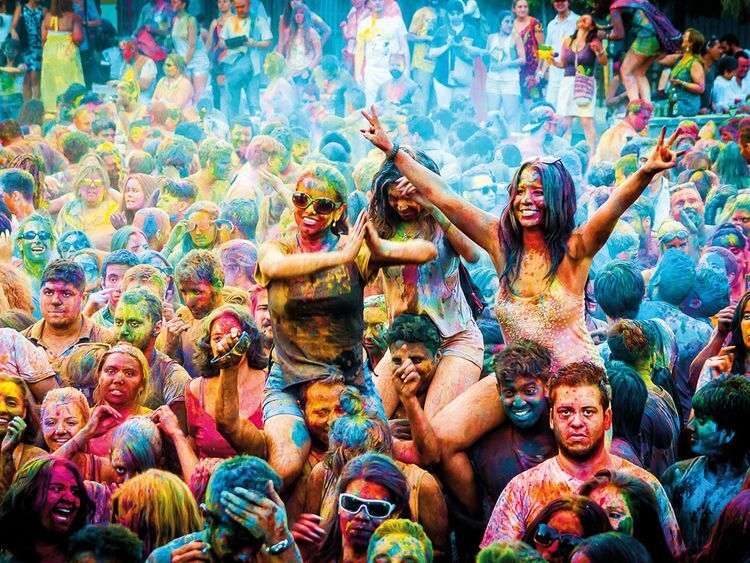 picks the top events making a colourful splash over the weekend. Indian hip-hop stars Badshah and Raftaar will be performing at Global Village for the festival of colours, bringing their respective signature sounds to the city. Badshah, who hit the big leagues with ‘Saturday Saturday’ followed by ‘Kar Gayi Chull’, will be belting out his biggest hits. Rapper Raftaar, who also made the transition from private music albums to Bollywood, is best known for his top tracks, including ‘Gal Mitro’, ‘Bandook’ and ‘Dhaakad’. The duo will be performing on the main stage. Details: At 9pm, concert included in Global Village entry ticket priced at Dh15. Artists that will perform live here include ‘Lat Lag Gayee’ singer Shalmali Kholgade, ‘Tukur Tukur’ hit maker Nakash Aziz, along with headliners Manj Musik and Nindy Kaur who are best known for their tracks ‘Singh and Kaur’, ‘Mar Gaye’ and more. Also performing on stage on the day is the local contingent, including Rooh Band, DJ Shadow and DJ Emwee. The annual Wonderland celebration will be a ‘wet Holi’ or one that will be played with water so keep that in mind. The venue will also feature food stalls, a kids area and a flea market. Details: Tickets from Dh45. Children below 12 years enter free. Entry from Wonderland Gate No 7. Singer Babu Haabi, best known for his hit ‘Chitta Ve’ from ‘Udta Punjab’ and now ‘Manmarziyaan’, will headline this event at The Beach, Dukes Dubai with a line-up of local DJs including Zubair, Scorpio, Bharat, Karan and more. VVIP cabanas, bhangra performances, shisha and food stalls also at hand for those who want to chill out. Malhaar Centre for Performing Arts is hosting a ‘Music in the Park’ community initiative for Holi. The free-to-attend event will feature more than 30 local artists, including children, who will perform traditional musical compositions. The launch concert will be a celebration of the festival of spring with Hindustani, folk and Bollywood music, rhythm and kathak and contemporary dance. There will also be live painting by local artists. “Malhaar aims to make this theme-based concept a regular feature by taking Indian music to the park, in the midst of nature, and involving the local community and showcasing their talent,” says Jogiraj Sikidar, founder and director of Malhaar Centre for Performing Arts. When: March 22 at 4pm. Details: At the Jumeirah Lakes Towers (JLT) Park. The event is free for all and held in association with DMCC. The celebrations return for a third year at Dubai Sports City with the Rugby Park hosting the Aks Color Carnival with entertainment provided by DJs Beatz, Gautam, Manoj, Nitesh and Carlos. There are also live performances by dhol players and carnival acts, along with food trucks and a kids play area. Details: From 11am to 8pm at Rugby Park, Dubai Sports City with tickets priced from Dh45 per person. Free entry for kids of age four and below. Tickets online. Here’s a Holi event that’s easily accessible to those heading from Sharjah, Ajman and the Northern Emirates. Nouras Beach 1 at Al Mamzar will be hosting the festival of colour with entertainment by dhol players and play areas for kids as well, along with plenty of food stalls to satiate those cravings. Details: At Al Mamzar Park, Nouras Beach 1 area from 10am to 6.30pm. Tickets Dh20, plus additional Dh5 for park entry. Tickets available online. The JA Beach Resort celebration returns with Bollywood music, food stalls and the open water to play Holi. Ten local DJs performing including Jeff, Buddha, Sib, Varun Sharma, Blaze, Mad Max, Atul and more. Children under five enter for free. Details: Tickets from Dh100, 11am onwards at the JA Beach Resort. A family friendly celebration at Zabeel Park where you can play with colours, along with enjoy live performances, dhol players and more. When: March 22 from 10am. Details: Zabeel Park, Gate 3 entrance. Tickets from Dh25 and available online. Kids up to three years enter free. This Holi rain dance will feature 15 artists who will perform across 15 hours of entertainment and perfect for those who are heading up from Abu Dhabi. Color Fiesta 2019 will be hosted at the Golden Tulip Al Jazira Hotel and Resort in Ghantoot featuring Goa’s Bollywood Queen Bhumicka Singh alongside DJ Mack Vieira with support from local artists DJs Hani, Tushar, Asef, G2, and so on. Live dhol, a VIP area — because why not — shisha, food stalls, and licensed. Details: At Golden Tulip Al Jazira Hotel and Resort with tickets priced from Dh30. Kids below 12 enter free. Bring a little bit of colour to your dinner plate as Khyber puts on a special spread for Holi. Khyber is offering a three-course set menu, both vegetarian and non-vegetarian, which includes welcome drinks and festive dishes such as gujia, dahi vada, pakora, barfi, bhajia, and live counters. You can make a night out of it by later heading down to the Dukes Dubai beach for the Color Fest celebrations (more on that later) with live performances and more food. When: March 20 and 21, from 6pm until 11pm. Details: Khyber, Dukes Dubai, The Palm, priced at Dh160 per person. Hilton Dubai Creek is marking this spring festival with an Indian family buffet at Glasshouse restaurant. Dishes on offer include onion laccha and spicy potato and coriander salad, chilli chicken, Punjabi aloo samosa to name a few. You can also indulge in famous street food delicacies including the pani puri station. Main courses include fish moilee, spicy prawn masala, chole masala, gosht mussalam and dal makhani. Finish the evening on a sweet note with gulab jamun, chocolate pudding and fresh fruit platter. Celebrate the colours of Holi at Taj Dubai’s signature restaurant. Highlights from a special menu includes traditional family style favourites such as: murgh seekh kebabs (minced chicken skewers) and Dal Makhani (slow-cooked buttery black lentils). Seafood lovers can enjoy jhinga anardana, a sweet and savoury prawn curry. When: March 21, from 6pm. Details: At Taj Dubai from Dh250 for a three-course Indian menu with inclusion of soft beverages and a thandaai or welcome drink. Feast on a hearty spread through a three-day buffet in celebration of Holi at Chor Bazaar. A special menu has been curated for the festival of colours, with live entertainment to get you into the swing of things. Details: From Dh195 with soft beverages at Movenpick Hotel Ibn Battuta Gate Dubai.